ArtCAM Express allows you to purchase additional feature modules as your business grows. These additional features can be easily added to your software after purchase and can help you expand the range of products you can offer your customers. You can test-drive individual modules in our free trial software or click on the button below to find out more information. ArtCAM JewelSmith is the premier solution for Jewellery Design and CNC manufacturing. 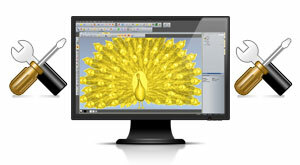 Featuring all the relief modelling power of ArtCAM Pro combined with specific jewellery tools and component libraries, please contact your local sales partner for an evaluation version or email info@artcam.com for more information.